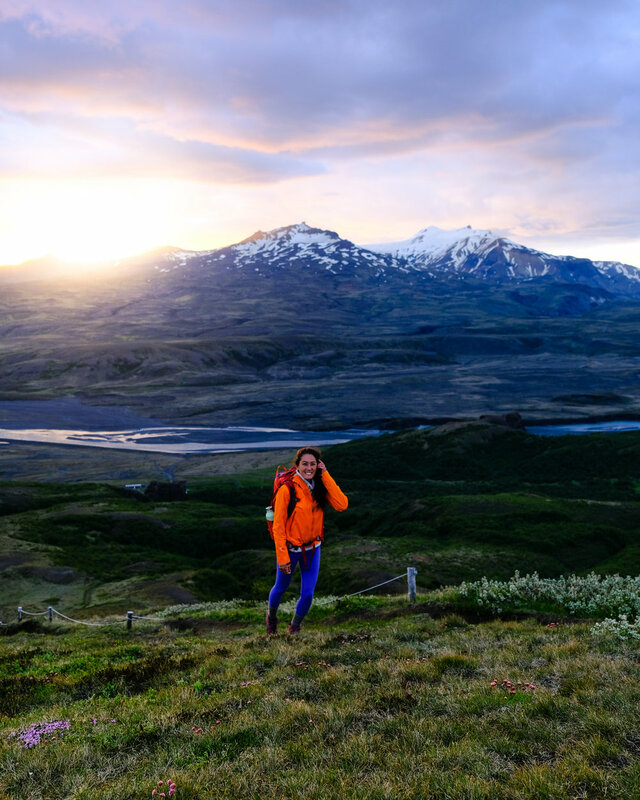 So as you guys probably know I've just returned from my spontaneous sixteen day adventure across Iceland. Initially I was going to a four day women's retreat. Ten or so days before my trip it occurred to me that well, four days just didn't quite seem like enough. I went for it, got a girlfriend crazy enough to take a week off from work and meet me there (thanks Holly :P). I'm weirdly excited to write this blog. Perhaps because - thanks to the retreat - I've started writing again. But more than that I think I'm excited to write this because I feel like I had actual experiences. 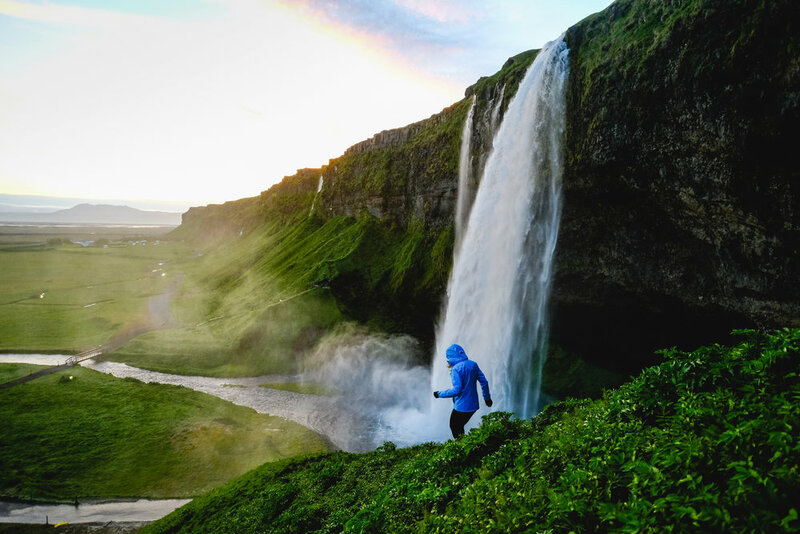 Iceland surprised me in ways I didn't think it would, I met strangers who became my friends, I found places that surpassed the thousands of photos I've seen (I was worried about this one), and for the first time in a long time I felt spectacularly present. Our lack of planning and the fact that I wasn't there for work lent it an aspect of freedom I've been missing in my travels. As much as I love love love to create and take photos, my favorite kinds of trips are the ones where I come back bursting with stories to tell and things to say. This trip had the most beautiful balance of both and I am so grateful. 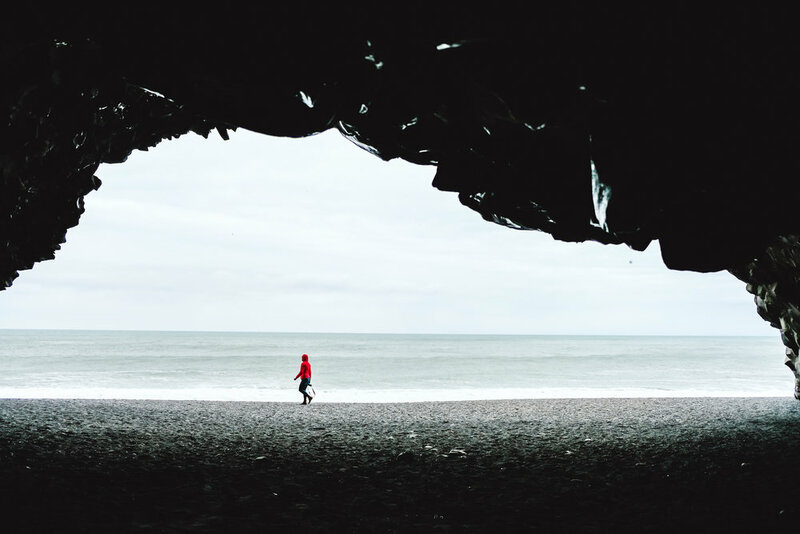 I'm going to break this entry down into a few parts to make it easier to navigate since (I'm assuming) most of you are going to Iceland/interested in going and want itinerary ideas. A little insight here – I did almost no preplanning for this trip meaning I didn't have a route mapped out, I consciously wanted to avoid the often visited southern coast photo spots, and I was attempting to do this kind of as inexpensively as possible. 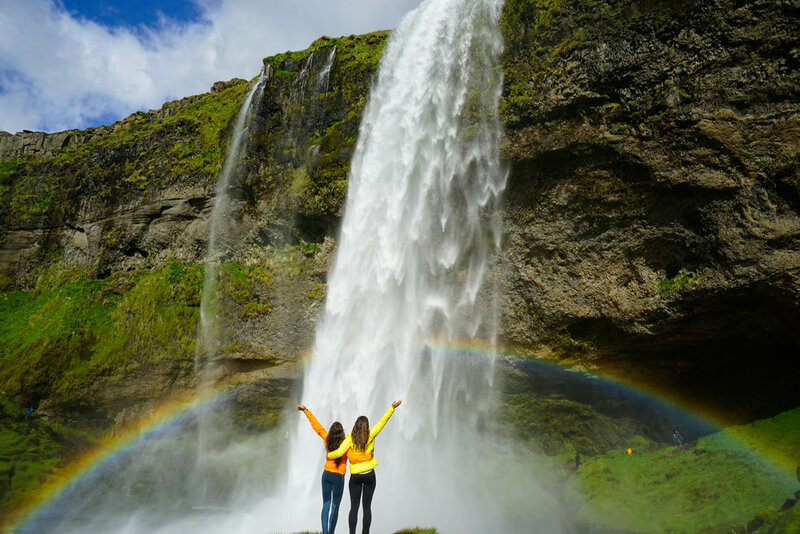 If you want a well written and beautifully photographed blog of a much more linear Iceland itinerary (clock-wise around the ring road of the island) I would recommend reading my friend Renee's article here. She so kindly sent me some recommendations, thanks lady. Iceland has been one of the most travel-friendly countries I've ever been to. With the great influx of tourism over the last 5 years or so I'm not that surprised, but it was still pretty lovely to experience firsthand. Language: Everyone speaks English, and really well. I guess they've caught on to the fact we can barely even pronounce their place names (RangárÞing eystra, Bláskófabyggð, Eyja- og Miklaholtshreppur) Yea. Get excited for Google maps saying street names. :) I think it's always polite to learn a few phrases though, like takk (thank you). Money: Extremely credit card friendly. By a funny turn of events Holly and I showed up to Iceland with exactly $3 USD. From camping to food to bus tickets, the sole thing we couldn't pay for with a card was the small donation/fee for a few natural hot springs. These amounts are generally a few hundred kronor (100 k = $1, so around $5-10 that you slip into an unmanned box). Check that your card doesn't have foreign transaction fees and charge away. Wifi: Get the wifi box if your car company offers it. 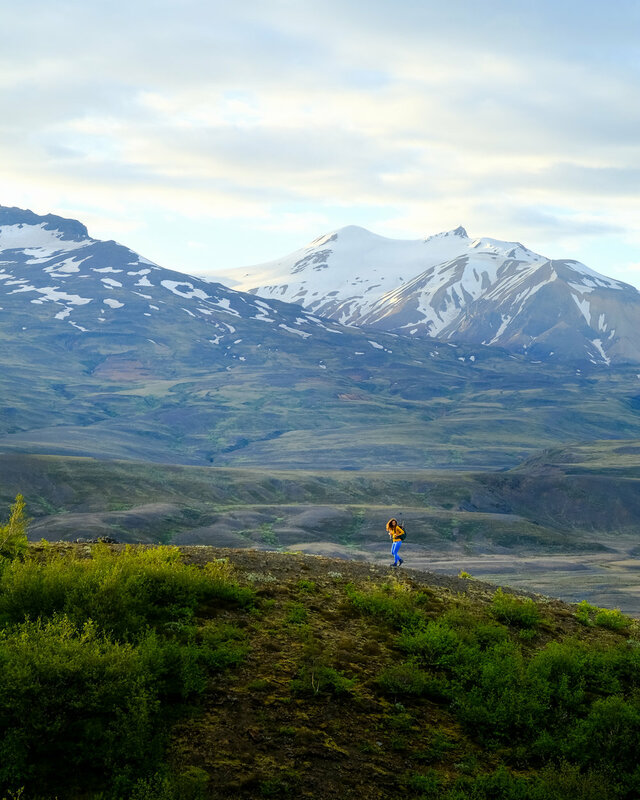 We had service across all of Iceland even in super remote areas. Great for maps (or use Google's download offline maps feature), looking for campgrounds, etc. If you opt not to, almost all campgrounds, restaurants, and gas stations (Nesti/N1) have open wifi networks and tables -great for a few hour stop to eat, charge computers, work etc. Which brings me to the next thing..
Food: Holy expensive. Expect to pay around $25 each for lunch and at least $45 for dinners. The saving grace are cheap and ubiquitous hotdogs from gas stations or stands around Iceland. If you have access to a refrigerator/ability to cook, going to a supermarket will also save you a ton. Alternatively, you can do what I did and bring food in with you. We brought vegetarian backpacking meals from Good-To-Go foods which we used to supplement snacks from the store. My favorites are the Penne Pasta, Thai Curry (bread is a cheap and yummy supplement to it as well) and the Blueberry Granola breakfast one (just add water so convenient when you don't want to cook). My caveat to this would be try to budget to eat out at least a few times. I found Icelandic food is often locally sourced and REALLY delicious. I had heard bad things about the food here, but that was not my impression at all. I'll list my favorite meals in the itinerary. 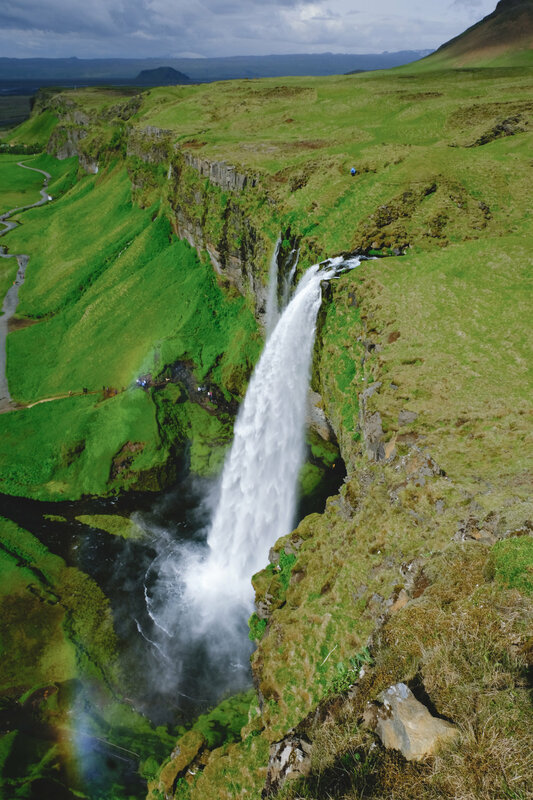 Water: Iceland is extremely proactive about recycling, composting, and being environmentally responsible. So pretty please bring a big reusable water bottle instead of buying water. The water in plastic is literally just tap water because their water is so good. People were more than happy to fill it for me where ever we went. In the remote Westfjords we even filled up in a waterfall (fast flowing and steep). It was great. Driving: Left hand drive and same as the United States. Things are probably farther than you think. 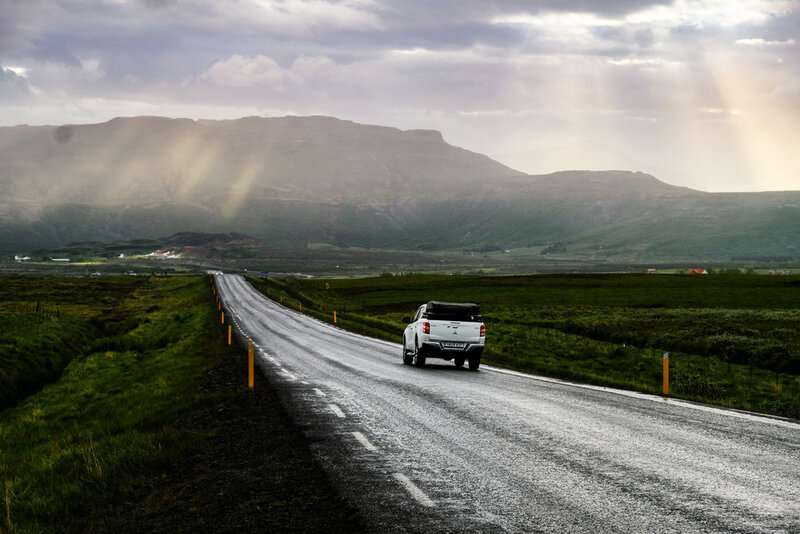 Unless you only stick to the south coast (Reykjavik east to Vik) where everything is relatively close, expect to drive a few hours a day. I drove more than 4,000 km in 15 days. Also, the speed limit is max 90 km/hr and ahem I may have been in the car when there was a speeding ticket involved. He got a discount for paying it on the spot, but it still was the cringe worthy amount of 52,500 kr (around $525). Driving off-road is prohibited and taken VERY seriously. You'll find plenty enough adventure on the F-roads which are the hundreds of miles of legal dirt roads. I opted for car camping because I wanted to see as much of the country as possible. It also fits my style of unstructured travel. If I find something cool I want to stay longer, if not keep going. 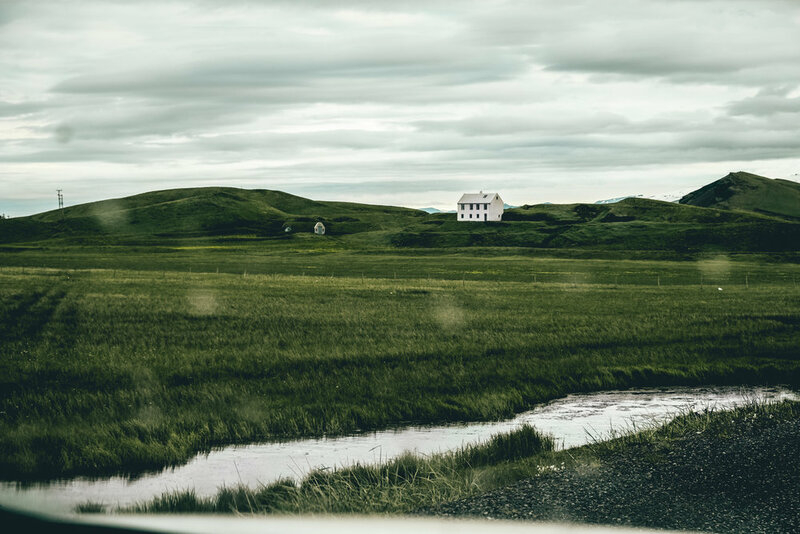 Iceland is a pretty perfect road trip set up since the main things to see are on the circular road around the coast of the island. We were super happy with our 4x4 mountain camper from the family-owned Lagoon Car rental. It was a brand new 4 door Mitsubishi truck that came with the pop up truck tent, cooking supplies (cups, plates, knives, pots, stove, etc), two towels, camp chair, sleeping stuff (pillows, blankets, sheets). Manual and diesel it was really good on gas, which was fantastic since gas is about $8.50/gal. The tent was super comfortable (there's a thick foam futon) and dark (good since the sun doesn't go down in summer). We kind of fumbled with the tent for the first few days, but by the end we could set up/break down in about 90 seconds. We debated on going with the enclosed camper option that they have, which could be a good if you're going when the weather is colder or you aren't as used to car camping. There were a few days where it rained and we kind of wished for the camper for easier cooking, but overall we loved it. I'm personally very partial to sleeping in a tent and crawling into the roof top tent each night added a level of fun and novelty to the whole experience. You can google campgrounds in the Maps app and a lot of them have their locations marked, or as you're driving look for the teepee symbol on signs. Last option that I would consider in summer is just renting a car and bringing a tent. It's actually easier to find places to camp as there are fewer restrictions. Details here on the photo. Depending on how many people you are with it might also make sense just to Airbnb/hotel etc. Since it was two of us this made the most sense. The route I took is a bit roundabout because a) we were kind of winging it b) I had to drop Holly off at the airport halfway through my longer trip. So to make it more useful I broke it up into regions and you can pick what you find interesting. Reykjavik heading south east – We drove this route during the endless pink sky of the midnight sun. Although it's the most photographed and visited part of Iceland I have to say it was also scenic to an impossibly lovely degree. We did this in all in one high-on-life-and-pretty-light morning as the sights are easily accessible from the road. 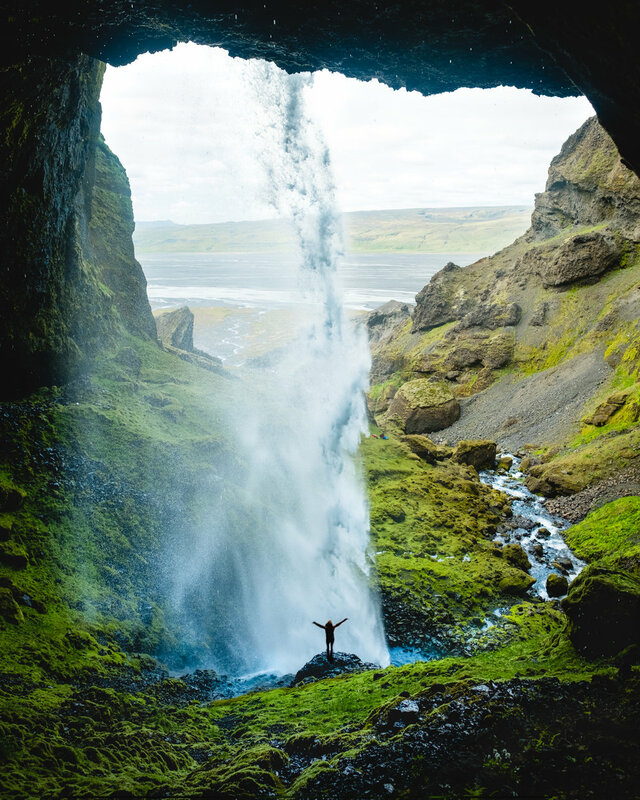 Think tall green mountains with dozens of waterfalls cascading hundreds of feet down their slopes, the white glint of an enormous glacier in the distance, sea side cliffs and rock stacks on black sand beaches, tiny churches and fields of purple lupine. There were many freak outs. List of highlights heading east: Seljalandsfoss, Skogafoss, Solheimasandur (US Navy Plane Wreck didn't do this one but looks cool for photos), Renisfjara Beach, Ofaerufoss, Dyrholaey (cool lighthouse, double check because the gate is closed certain times of the year for the birds), Vik, Fjadrargljufur (incredible canyon with a river running through it). There are a TON of resources/blogs written about the south coast so I'm not going to try to reinvent the wheel here. We were lucky to be hosted by the Volcano Huts for two nights in their newly opened “glamping” tents. Icelandic horses grazed in front of our tent (my favorite part), which was quite spacious and outfitted with two beds, a space heater, a table and cozy chair. Shower and bathrooms were communal for us and the traditional tent campers whereas the cabins had their own. Meals are available at an additional cost (around $25 for breakfast/lunch and $45 for dinner) which we opted to do because there aren't any other options around (you're really awesomely in the middle of nowhere) and the food looked amazing - selections of breads and hearty soups, salad, seared fish, local meats, vegetables etc. Holly about 15 minutes in. Muted colors in the interim between sunset (1 am) and sunrise (3 am). 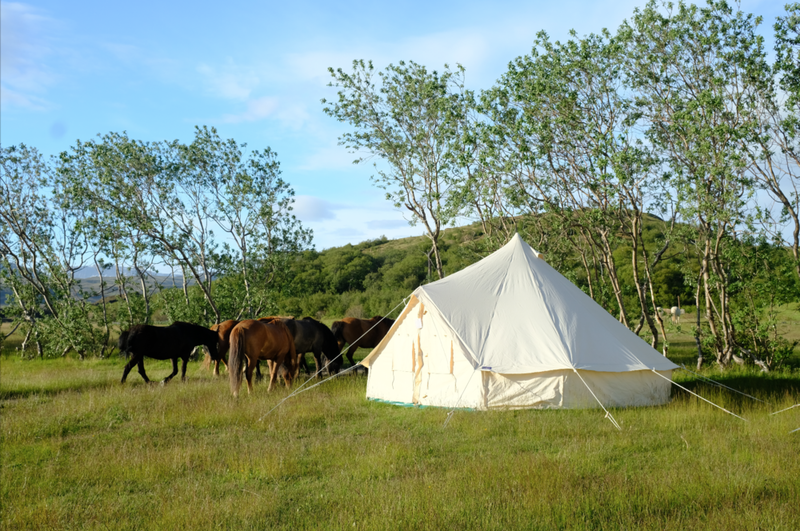 Our glamping tent with the Icelandic horses doing their daily lawn mowing. This drive started our love affair with hot springs. 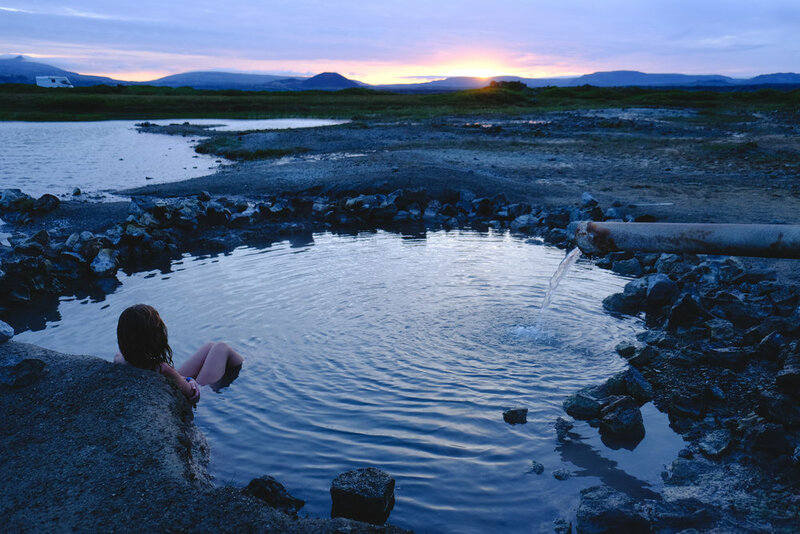 Just 18 minutes from the international airport is the very famous geothermal Blue Lagoon. It's gorgeous, enormous, so damn pretty and equally as crowded. Although I tend to avoid “tourist” stops, we did this right before Holly left as a way to be a bit luxurious before she got on the plane. We did silica and Algae face masks, ate a glorious dinner, and stayed until it closed at midnight. The last hour in the pool was the best since we could find entire little inlets to ourselves. If you do get your hair wet (not recommended!) make sure to use a really good clarifying shampoo and moisturizing conditioner afterwards. Heading north through the capital of Reykjavik we ate lunch at Gló, a super yummy vegetarian cafe. Try the pesto lasagna then stop at a Bonus (supermarket) for grocery supplies. Kirkjufell – personally I wouldn't go out of my way for this one. It's on the side of the road (there's actually a road between the waterfalls and the mountain) and you'll be tripod to tripod with other photographers. If you're driving around the peninsula already, sure, but manage your expectations to know you won't be the only one there. There's also a new fence around the edges of waterfall asking people not to go to the base or to the edge. 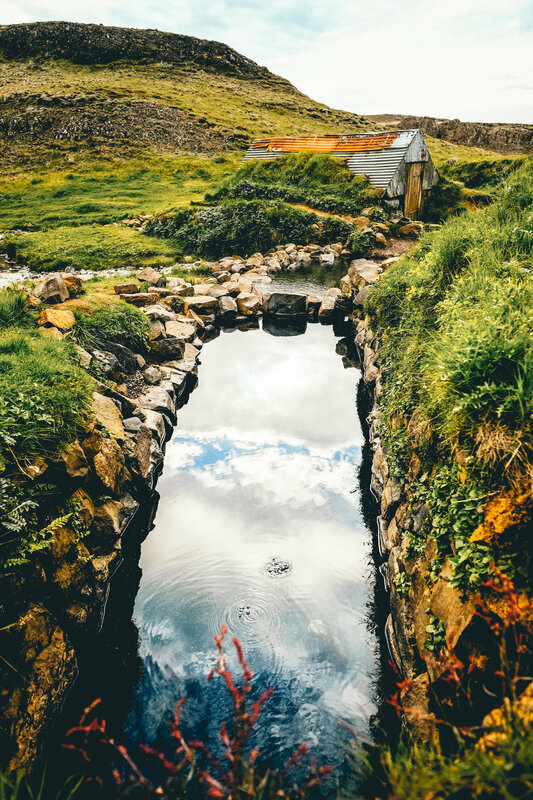 Landbrotalaug hot spring – one of the more epic mornings of my life. Hungry and tired we drove semi disappointed from Kirkjufell to a small dirt parking lot near the “neck” of the peninsula. In the blue hour between dusk and dawn we picked our way over some stones laid across the river to a hot spring pond maybe 10 ft x 12 ft. A pipe feeds in (nearly) scalding hot water and the pool is shallow but perfectly hot on a cold night. We sat there for almost two hours enjoying the never ending sunrise over the distant mountains. We also went back the next day to the “hot pot”. It's very small (2 people max) and smells much more sulphuric than the bigger pond, but is still lovely. From the parking lot it's to your right, you'll see a low stone barrier shielding it. 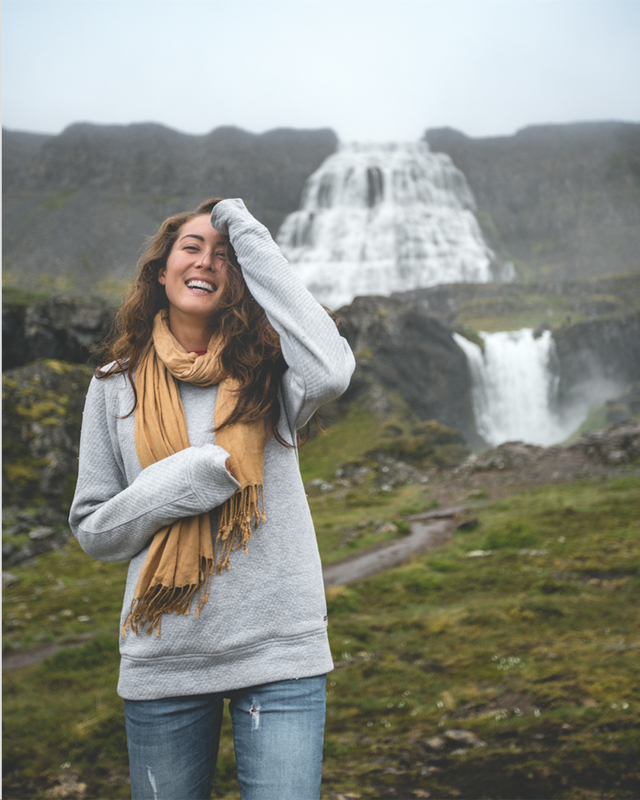 Brúarfoss – beautiful cascading waterfall near the more well known Gulfoss. We had trouble finding this one even though it isn't too far off the main road. Park the car by the bridge over Brúará (on road nr. 37) and walk upstream 3.5 km to Brúarfoss (walk on the east side of the river). Also, if you walk upstream from the main road you get to see the other two waterfalls as well. Other maps might tell you to drive into the gravel road of the summer home area, but this is technically private property. 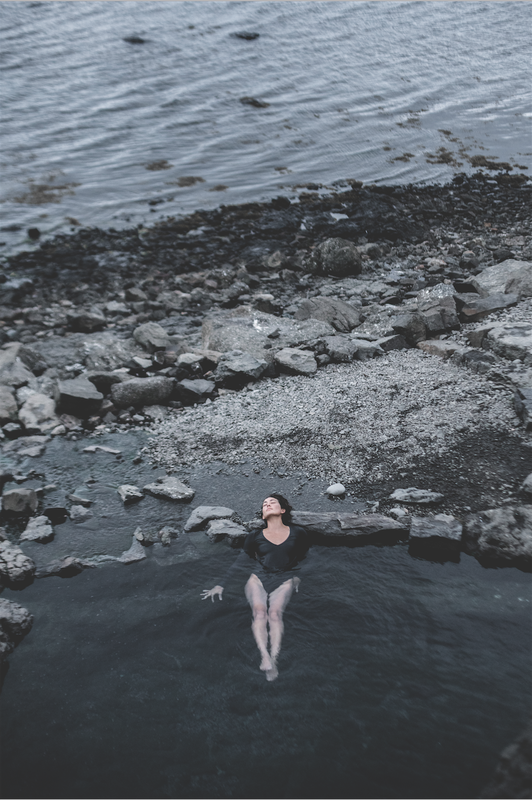 Hruni hot spring – like most things in Iceland apparently used to be very quiet but in the two times we visited there were between 2-10 other people there. Still lovely though and a really nice temperature. No camping in the parking lot allowed, but there is a big grassy campground right in town. One statistic I read said that only 10% of visitors ever make it to the Westfjords. These fingers branch into the north with their expansive landscapes and undulating roads. At times we drove for hours without seeing another car, yet we also sat in a hot spring by the sea with 8 other people. So it's mix. The West Fjords felt wild. Moments of intense rain and fog added to the mysticism. What are you hiding from me? The mountains got more vertical and closer together the further we drove. I would definitely recommend making it out if your itinerary in Iceland is a longer one. 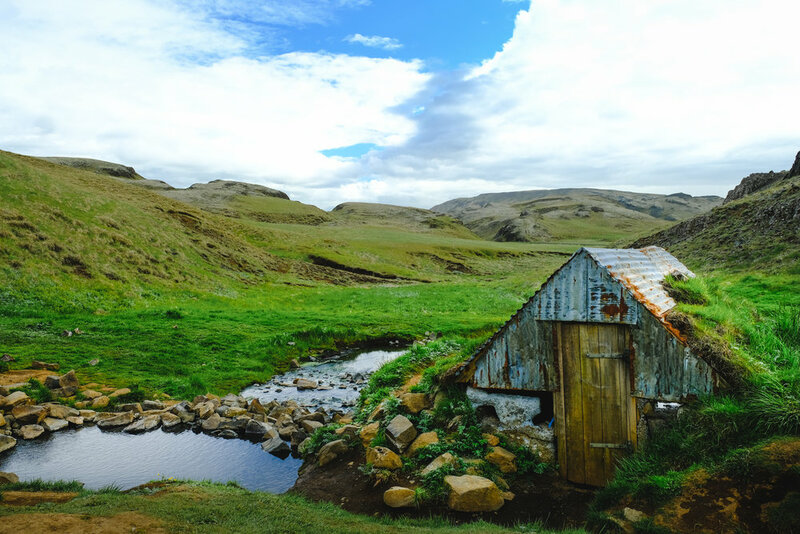 Everything is much farther apart than on the south coast, but the drives are stunning and continuously changing as your weave through small fishing villages, along inlets, and back into snow capped mountains. 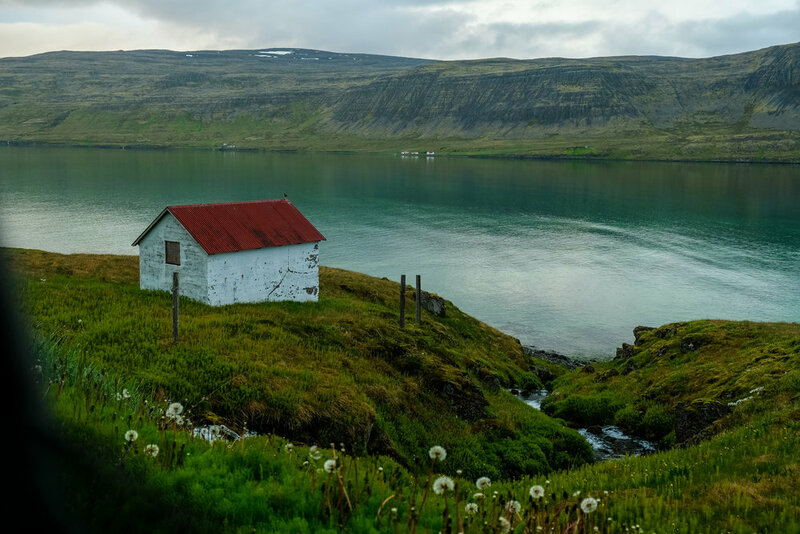 It's my dream to come back and hike in the Hornstrandir nature reserve, which you need a boat to get to. We drove in on the 60 hitting the southern edge first then turning north towards Ísafjörður spending 4 days total before heading out to Akureyri for my retreat. I think 4 -5 days in the area is a good amount of time to budget for the first go around. You could rush it in 3, but what's the point of driving for hours just to rush through the experience? Be prepared though, as the weather can be much less favorable than in the south. Highlights: Dynjandi waterfall, Hellulaug (hot spring next to the ocean), Látrabjarg (beautiful cliffs), Rauðisandur (red/white sand beach), Reykjafjarðarlaug pool (there's also a natural hot spring just little ways up the mountain), Pollurinn natural thermal pools (there are three) in the Tálknafjörður village – amazing views. EAT HERE: Vegamot Bildudal Cafe, Bildudalur (near the Icelandic Sea Monster Museum)– This was the best meal I had in Iceland. The arctic char and salad were sublime and simple. Good, local food in a tiny restaurant hidden in the back of a grocery store with views of the water. These are the kind of travel gems I just love.